This article is meant to provide you with a basic overview of the extendedReach Reports Types, Activity Types and Print Templates within Programs. If you have a question not addressed here, you can search at the bottom of this article in Related Topics where details are for each of these concept are provided. Or you can Contact Support. Go to “Program Settings”, and click on “Program Activity Types” or “Program Report Types” or “Program Print Templates”. 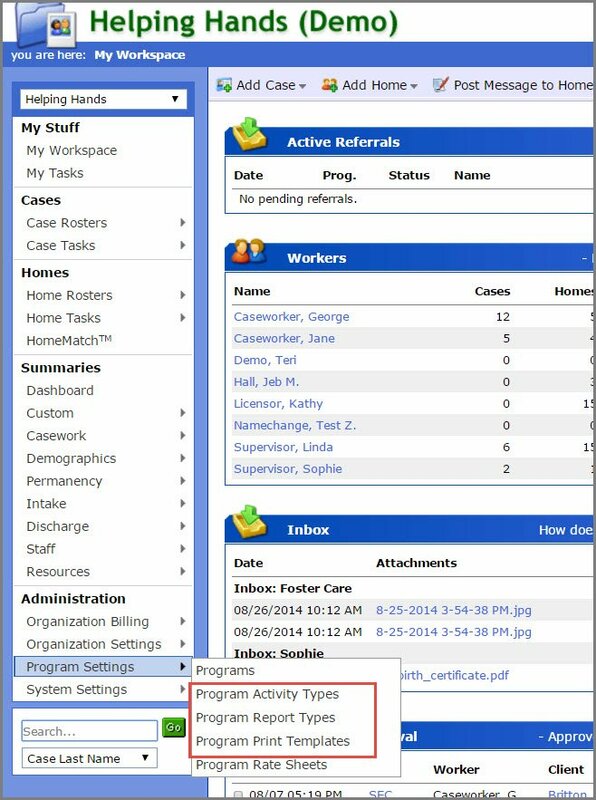 Activity Types control your list of available Activities within a particular Program. Activities are events that occur at a certain point in time and need to be documented. These are typically collateral contacts such as phone calls, letters, or email. Activities usually have an associated case note or narrative and may also have associated file attachments. Report Types control your list of available Reports within a particular Program. Reports are typically documents that are either collected or generated/written by your staff, and often have a due date and an associated file. Examples of Reports are written documents, such as service plans or assessments, or collected documents, such as birth certificates or social security cards. Print Templates are printable forms that auto-fill with information from a Program. These completed forms are not saved/stored in the system, but can be regenerated at any time with up-to-date information from the program database. Examples of Print Templates are face sheets or case note summaries.